This week’s Sunday Supper Event is all about family, heritage and traditions, hosted by Galactopdx. I've recently shared a few of my families recipes during #SundaySupper and today I am featuring my Nanny Wood's Creme De Menthe bunt cake. This cake was made for every holiday and smelling it bake will always remind me of my childhood. 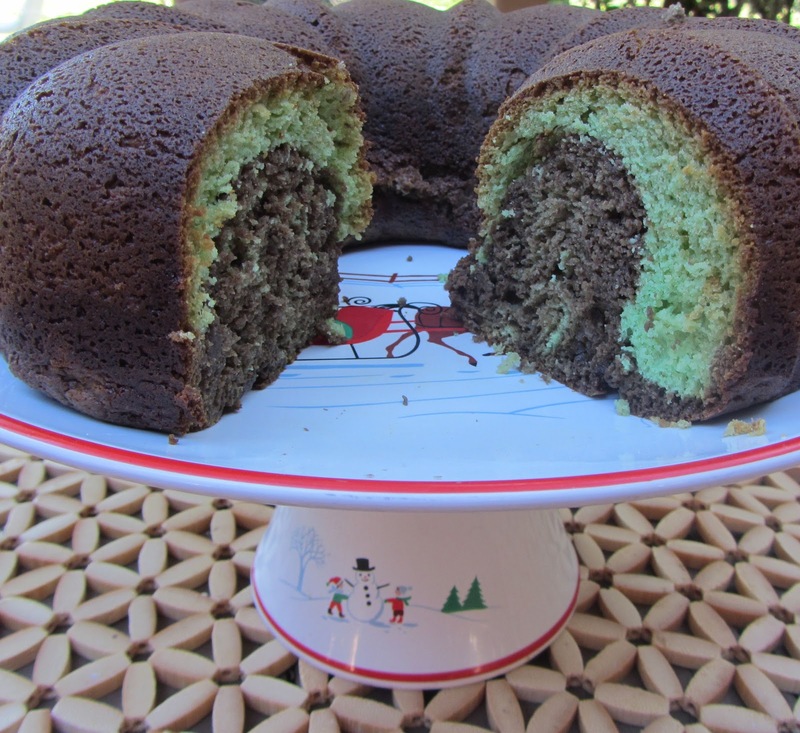 This is a simple cake, made with yellow cake mix, pistachio pudding, chocolate syrup and creme de menthe. 2 Combine cake and pudding mix. Add eggs, beating one at a time. Add all other ingredients (except choc syrup). Beat well. 3 Pour 2/3 batter in greased bundt pan. 4 Mix remaining batter with chocolate syrup and add to the top DO NOT MIX, JUST LAY ON TOP. 5 Bake at 350 for 55 min. Cool for 30 min then remove from pan. What are you family traditions? Come share them with us this week during our #SundaySupper chat at 7 pm Eastern Time. Check out these fabulous Home for the Holidays recipes from the #SundaySupper family! What does it mean for you to be Home for the Holidays? Please join on us on Twitter throughout the day during #SundaySupper on December 23rd. In the evening we will meet at 7pm EST for our #SundaySupper to talk about our Holiday Traditions. We are so excited to have you join us. All you have to do is follow the #SundaySupper hashtag or you can follow us through TweetChat. Please feel free to share with us and our followers your favorite Holiday recipe on our #SundaySupper Pinterest Board. We are excited have you Around the Family Table for this special Holiday Meal. What a fun and easy cake... can't wait to try this recipe. It has been such a pleasure getting to know you and meeting you Megan. I am so glad you are part of #Sundaysupper. Happy Holidays to you and your family! I love that this is so easy to make! Gorgeous! Oh, my mint loving family would adore this! And I love the shortcut with cake mix...perfect for this busy time of year! Happy Holidays!!! The idea of creme de menthe is great, I love it! And that plate is just wonderful! Happy Holidays! Just took a peek at your bucket list - I'll have to look into the napa to sonoma half...i like the sound of scenic and fast! I have the Will Run for Wine magnet on my fridge. It describes my life for sure : ) Wonderful looking cake. My aunt just made one like that with pistachio but I bet mint is even better! I love the idea of using creme de menthe in a cake. What a pretty cake with the two colors! I would totally never thing to put OJ, chocolate, pistachio, and mint together, but it looks delicious! Ahhh, a nice 'n easy recipe, so invaluable at this crazy busy time of year! The cake looks beautiful and I adore your holiday-themed dishes. I hope you had a very merry Christmas and a wonderful holiday season with your loved ones! Such a pretty cake for the Holidays! I bet it is a crowd pleaser for sure! Hope you enjoyed your Christmas and wishing you a Happy New Year! I love the idea of a minty cake. And that plate is pretty awesome!